Meet Chris Hay, an organic farmer in Yolo County. Chris became a farmer because he was attracted to the craft and art form of farming. See what he’s up to at Say Hay Farms! Chris: I am ordering seed as we speak, last minute stuff, dealing with a back order. I am trying to make last minute substitutes for seeds that are no longer available. It’s the end of the seed season scramble. I have a meeting with one of our larger customers later today. I was out in the field earlier this morning. We’re getting cover crops mowed and beds prepared for our first transplanting of the year next week. Chris: I would say it’s the fact that a lot of the day-to-day small things we do can aggregate to have large scale social and environmental implications. Just by the way we structure our businesses and conduct ourselves we can conduct meaningful change. Chris: I think it’s more that we are in the central part of the community and it works both ways. We need the people that rely on us for the food supply. We are part of a community rather than giving back to one. Agriculture is the center of our communities and culture in a lot of ways. Not only in the food we eat but also in a lot of the cultural things that we do, like holidays, weddings and birthdays. They are centered around our food. 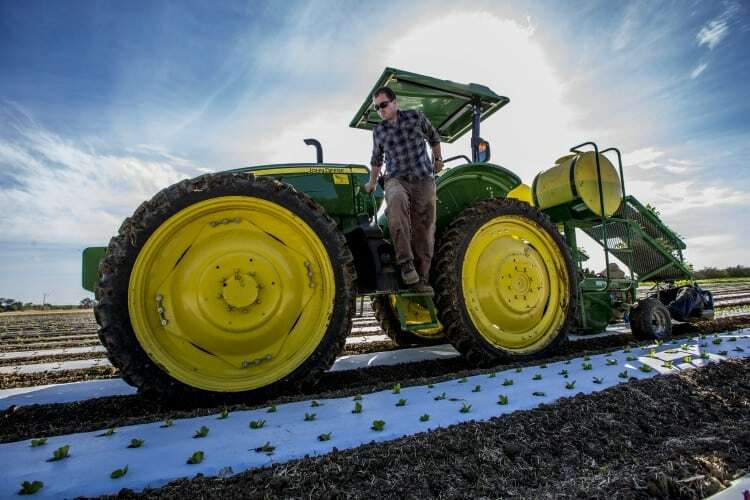 CAGROWN: What drew you into the farming profession? Chris: I was an idealistic kid right out of college and saw that farming really just meshed with a lot of the practical interests I had. I liked that it was centered around food and was an outdoor activity. I was attracted to the craft and art form of farming. And I was really sucked into it when I realized there’s just as much craft and art form in building a business as there is in growing food. Chris: This is year six of our business and it’s just in this last year that I started to take more time off and that’s because I have a seven-month-old daughter. So I’d say being a father. Chris: I would say get experience first of all. There’s a lot of romanticism as to what is actually involved in day-to-day farming. And get experience in different kinds of farming, whether its livestock or orchards or vegetables. I’d say vegetables are the biggest hustle of the farm world. In California we farm 50 weeks a year so keeping that pace year-round can be challenging, but for a certain type of person that is also really attractive.